Let us handle your ride to and from John F. Kennedy Airport with our professional JFK Limo Service. For many years now Drivers Unlimited has been providing top-rated JFK Airport transportation service. Our clients in Fairfield County Connecticut and Westchester New York are consistently satisfied with our relaxing and on-time service. Our family has been using Drivers Unlimited for more than 15 years. They are always punctual, professional and dependable, especially for those 4:30 am pick ups! They always pick us up seamlessly at the NYC airports, know all the area shortcuts and even provide references for car services in other states. We highly recommend Drivers Unlimited! We make it easy to find us. For instance, please look for our chauffeurs wearing our unique red hat. If you requested an express pick -up, please meet your car and chauffeur downstairs at the arrivals level at the passenger pick up area. Inside the terminal your JFK limo chauffeur will meet you in the baggage claim area if you arrive on a domestic flight. If you arrive on an international flight your chauffeur will meet you outside of customs. 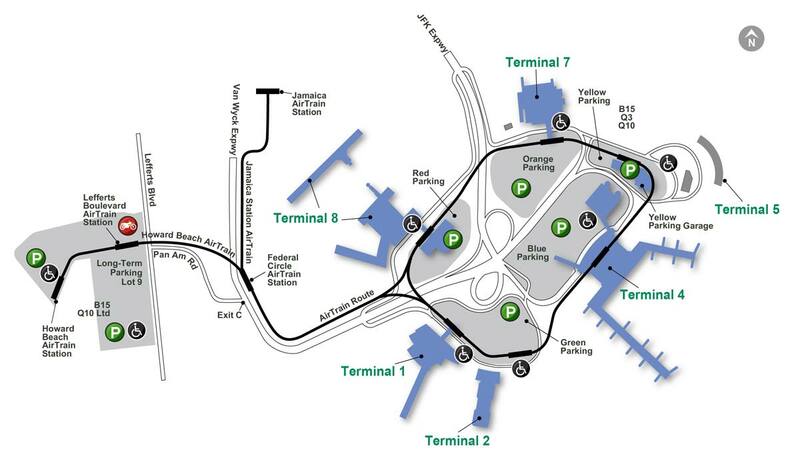 If you requested an express pick -up, please meet your car and chauffeur downstairs at the arrivals level curbside. Airlines Served: Aero Mexico, Air Jamaica, Asiana Air, China Air, Continental, Delta, El Al, Emirates Air, KLM, Northwest Air, Singapore Air, Swiss Air, Virgin Atlantic. Domestic flights: your JFK limo chauffeur will meet you in the baggage claim area. International flights: your chauffeur will meet you outside of customs. For all arrivals please deplane, collect all of your luggage, and cleared customs as needed. Once you have cleared, please call our office at 800-637-5440. You will be instructed to exit the terminal downstairs at the arrivals level. Then please proceed to passenger pick up area ‘4’ where your JFK limo car and chauffeur will meet you. Domestic flights: your JFK limo driver will meet you in the baggage claim area. If you requested an express pick -up, please meet your car and chauffeur at the arrivals level downstairs curbside at the last door. Domestic flights: your JFK limo driver will meet you at the baggage claim area. International flights: your driver will meet you outside of customs. If you requested an express pick up: your car and chauffeur will meet you upstairs at the departures level at the last door. Please look for our vehicles with our unique red flag on the passenger side window. Whether you are traveling for business or pleasure, Drivers Unlimited aims to make your JFK Airport transportation as pleasant and relaxing as possible. Our service is about making your travel experience soothing and hassle free, with our comfortable vehicles providing you a stress-free, tranquil environment where you can stretch your feet and relax. Our Service guarantees to get you to your destination in style and comfort without any hassle. Therefore, you can relax and trust the professionals at Drivers Unlimited to take care of the road. Drivers Unlimited’s JFK car service is the most dependable and efficient transportation service in the New York area. We only utilize experienced chauffeurs with spotless safety records. Our punctuality and commitment to customer care shines in every airport service that we provide. We invite you to reserve an airport ride with Drivers Unlimited. Be assured, our chauffeur will be promptly parked in front of your door or by the curb side when you touch down at JFK. When you reserve airport transportation with Drivers Unlimited, we clearly communicate the meeting location. We are here to accommodate your needs. For instance, some of our clients choose our Meet and Greet Service. Specifically, our chauffeur will meet you inside the airport terminal, helping you with your luggage and assisting you to the limousine. What makes our service so spectacular are two inseparable parts – our vehicles and our chauffeurs. Come on board our beautifully designed limousines next time you need a JFK Limousine Service and be impressed. Drivers Unlimited guarantees promptness of our service. When you pre-arrange your ride and provide us with your flight details we will track your flight to ensure our chauffeur is dispatched according to your latest expected time of arrival, ensuring that a vehicle is always promptly parked ready when you touch down. In conclusion, we look forward to transporting you next time you travel to and from JFK.